Home > Customer Reviews > Very Happy! I am so very happy with my experience with Surgenor Hyundai Tarek Abdel Fattah gave us a fantastic deal. He went out of his way to get our business. My Dad was ill and our timing was tight. Tarek took very good care of us. He stayed late so we could negotiate our deal after our hospital visit. We left feeling confident that we got the best deal we could. I have no regrets & we love our new 2017 Santa Fe SE. Sean Kelly was also fantastic to work with. The overall feel of this dealership is friendly and welcoming. I received amazing customer service from Sillin, she was really helpful and took the time to help me choose my first car. I have no regrets, my car is working perfectly thanks to Hyundai. Your service department was beyond amazing. I came in late Friday night from out of town with a broken muffler and no time to spare. Jayce took care of everything. He got me a rental car ASAP and sent me back to my hotel with the assurance that he would take care of it. And he did. Less than 24 hours later I had my car back all fixed and ready for the long drive home. Thanks to Jayce I was able to focus on my son's competition and not my broken car. Thanks again!!! 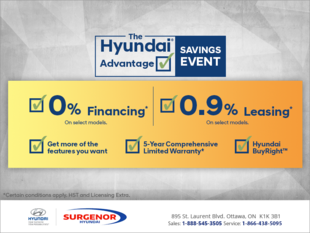 We visited Surgenor Hyundai while on vacation in Ottawa, when we had a check engine light come on in our car. I called the service department at 7AM to see if I could have the car looked at. We arrived to the dealership shortly after. They provided a complimentary car wash, and our car was serviced and we were back on the road by 8:30am. The staff were all great!!!!!! Thanks for the fast service. Thanks to Surgenor Hyundai we didn't miss any of our vacation plans. Regrettably, I did not purchase my 2013 Santa Fe from Surgenor, but I bring it here to get serviced. Today I brought it in to get a wiper blade replaced. Not only did they not charge me for the wiper, they installed free of charge! Their service is well above the rest! I highly recommend this car dealership to anyone considering buying a new vehicle. Thanks, Surgenor Hyundai!